Ever wanted to try out the dangerous sport of rock climbing but don’t know where to start? Having gear that is reliable is important, as one slip can result in you being dashed on the rocks. So why not put your faith in the best climbing harness the market has to offer? Instead of casting your safety to the wind, you should dedicate some time to figuring out which harness would be best for you. You’ll be thankful that you put in the time and effort into scoping out the different kinds of harnesses, their materials, and how much weight they can hold until you’ve found one that’s perfect for you. We will not only discuss a few products today, but will also show you which features are the most important for you to consider so that you can walk out of the store happy. Without further ado, let’s get started. Before you go out and pick up the first harness you see in the store, it’s important that you know everything a harness has to offer, including types, kinds of straps, and the weight limits so that you can find one that’s not only comfortable, but was also made for your safety. Here are just a few of the more important features to keep in mind. Depending on the activity you’re going to be engaging in, you’re going to need a harness that’s capable of handling your activity while keeping you safe. Although they may all look the same, they do have some key differences in their structure that makes them better suited to certain kinds of climbing. Sport/Gym: has the most basic of features to make them extremely light; most common features include single automatic/double-back waistbelt, two gear loops, and thin belay loop. This type doesn’t have a lot of adjustability for legs and instead of using buckles, the leg is strapped using a stretchy material. Traditional: maximizes on space while still keeping you comfortable; most common features include adjustable leg straps, four or more gear loops, padding in waist and legs, and haul loop for extra rope. 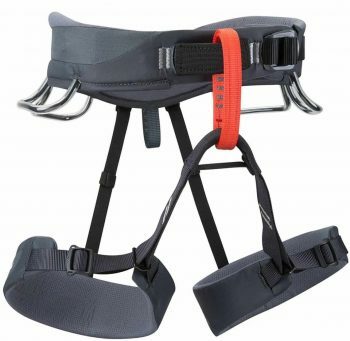 Ice and mixed: same as traditional harnesses, but is designed for winter/cold conditions; most common features include adjustable leg straps, four or more gear loops, extra lumbar padding, and a haul loop. Alpine/mountaineering: this type is definitely more versatile as they have a lot of features that you can use or forget about, depending on your level of activity; most common features are fully-adjustable leg loops and waistbelt, four or more gear loops, thin belay loop, haul loop, and the use of thin material in its body so that it can be worn easily with a pack. 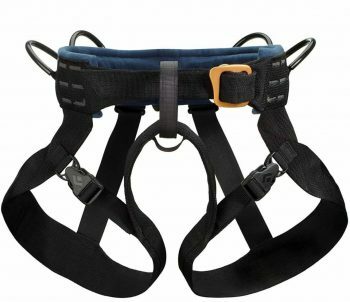 Specialized: this type of harness is incredibly specific when it comes to the activity it is designed for such as canyoneering, competition climbing, big-wall climbing, and rescue harnesses. This type is not usually for commercial sale to all customers. This is the distance between the waistbelt and the leg loops; this distance is crucial in determining your comfort levels during your climb. If the rise is too short and the leg loops sit too high, then its inevitable that you’ll be thrown back when you’re hanging. On the other hand, if the rise is too high then the leg loops will sit too low, then in the event of a fall, your hips will absorb all of the shock. A well-fitting harness should keep you upright and balanced whether you’re hanging or falling. If you find that you are struggling to stay upright, then it’s safe to say that the harness rise is wrong. For safety, it’s important to know what the weight limit of your harness is, or you could be in real trouble. Although a harness may fit properly, if it’s not designed to hold your weight on a line, then it’s going to break very easily which could lead to serious injuries. In addition, you will also want to have reliable buckles in your harness that are preferably doubled back and features auto-locking. Lastly, it certainly won’t hurt to check the harness if it is threaded correctly for that extra piece of mind. You may think that it’s only important for a harness to feel comfortable while you’re standing, but it also needs to be comfortable while you’re sitting as well, depending on the kind of climbing you’ll be doing. If you’re going for single-pitch climbs, then a comfortable-while-standing harness may be just what you need. Just be on the look out for bulky padding, as these will be more uncomfortable. Look for ones with breathable mesh or “two-part webbing” to keep you cool and dry during your climb. If you’re going to be doing a lot of hanging, then you want a harness that is comfortable while you’re sitting. Look for harnesses that have wide waist belts and lots of padding to provide the support and comfort you need while you’re suspended above the ground. 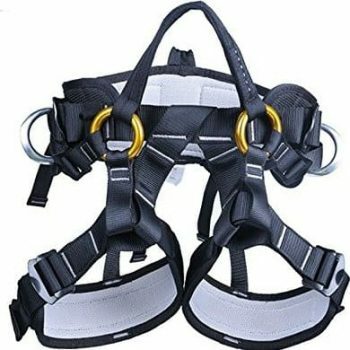 A large number of the climbing harnesses in the market have no more than four gear loops, but there are others that have some as few as two and others as many as six. These loops are designed to help you carrying your belongings up with you during your climb so that you’re not leaving them behind. What’s most important about these gear loops is where they’re located on the harness belt. If they’re too far forward, then your gear will constantly be hitting your thighs during your climb. However, if they’re too far back, then you’ll have difficulties reaching what you need. A second important features of these gear loops is what they’re made out of. Rigid loops made from plastic are easier to clip, but can be a bit uncomfortable when it comes to backpacks; flexible loops are a bit easier to deal with, but can feel a bit flimsy. With these features out of the way, we now present to you the best rated harnesses in the marketplace to help you get started on what customers are buying. You can choose one of the products listed below, or you can use this list as a stepping stone for finding a harness that is more suitable for your needs. So here’s the best products for you to peruse through. The Petzl Calidris Ventilated Harness is adjustable, comfy and well-aerated for prolonged hanging bouts. 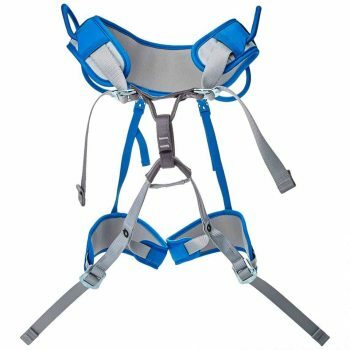 Its leg loops and broad waist belt provide a lot of support, comfort, and ventilation which is needed during extended assistance courses, as well as events demanding stretched periods of hanging, equipping and cleaning routes. Very comfy and lightweight plus a huge capacity to carry gear, the Calidris is impeccable for climbing big walls. Its size is made to fit large handlers being the most extensive size in the range of all Petzl harnesses used in the various kinds of climbing. Tie-in points are strengthened for more opposition to abrasion caused by the rope. Slots which are elastic have tabs for tucking away surplus waist belt webbing. The level webbing bolstering in leg loops and waist belt give improved coziness while hanging. 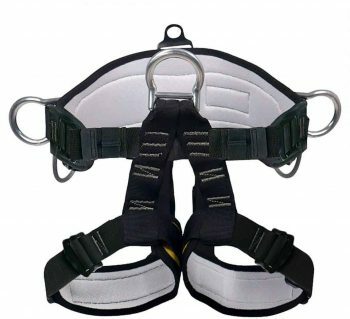 This harness also has four places that are semi-rigid to set up your quick draws without any fuss. You will not experience any pinching in falls, as it distributes force evenly. Related: Looking for a secure way to keep your gear together while you’re rock climbing? Then consider the Black Diamond Positron Screwgate Carabiner. Instead of a spring-loaded opening, it uses a screwgate so that there’s no risk of the weight of your gear pulling the gate open. It’s lightweight but also very durable, so these will definitely last you a very long time. Price, comfort and versatility make the ABC Guide Harness an absolute mountaineering classic. It is ideal for any group or school use. This harness is comfortable for short periods. Never assume it to be as comfortable as a more expensive harness. You will get exactly your money’s worth, a strong, safe tackle without extra bells and whistles like padding. It is not a “Cadillac” climbing harness. It is for those who live on the rocks and does not come in spring meadow scentor alpine fresh. It is a cheap, no frills harness that does exactly what it is made for. Overall, it is an exceptional product and recommended for anyone who needs a good all-around climbing harness. Though inexpensive, it lacks a guidance loop on the bottom strap, which might make a climber a little nervous. However, it’s a good first harness to get if you’re just starting in the sport and don’t want to spend too much. Related: Having climbing chalk while you’re on your excursion is important, as it eliminate any sweat from your fingers so that you can maintain your grip. However, carrying a ball of chalk with you can be burdensome. Instead, consider the two Ogres Essential Z Chalk Bag, which comes with a belt and a zippered pocket to ensure it remains with you, and is also easy to open and close for when you need another hit of chalk. For an all-around climber who knows that the time you spend fiddling with leg loops plus fine-tuning a pinching waist belt can never be recovered, the Black Diamond Momentum Harness will deliver the goods. It has a design that saves time suitable for all kinds of climbing. The TrakFIT leg loops adjust easily, and the haul and four gear loops are pressure-molded to make this a more prevalent product. The innovative design comprises of double bands of webbing which are fragmented around the waist belt, to allow full comfort and assistance minus pressure points. Black Diamond employs a sensitive CLPE foam insert with a sturdy, abrasion-resistant nylon casing for multipurpose performance. Its brilliance in design is in the leg connections. Instead of tightening up the harness when it is supporting your weight, the leg bands are independent. They take off a significant portion of the load, leaving you feeling unburdened by your gear. Related: Being adequately prepared for your rock climbing excursion will make the experience more enjoyable. That’s why you shoulder consider a pair of rock climbing shoes, and La Sportiva TarantuLace Rock Climbing Shoes have you covered. They’re made with leather so they’ll conform to the shape of your foot the more you use them, and has protective rubber on the important parts of the soles to provide you with traction on those jutting rocks. Best use: Rock climbing and mountaineering. The Ingenuity Climbing Harness is made from polyester with a reinforced tie-in point and stitching, this harness lasts under extreme use conditions so that it can be used both for indoor and outdoor climbing. It’s versatile enough to be used on a ropes course as well, providing you with a very flexible tool at your disposal. It is light, comfortable and well-made, and is extremely easy to put on. The thickness of the belts also makes them extremely adjustable for children, as well as women. And with cotton fiber being added to the blend, as well as the padded areas on the leg straps, you know it’ll be comfortable against your body. You’re definitely getting a quality product for the price you’re paying for this wonderful harness, especially if you’re just starting out in the sport. Overall, this harness boasts great quality, easy to put on and available at a great price. Related: Ever struggled with getting your lines high enough before you start a climb? The Weaver Leather Throw Weight and Line Kit will get you started on the right track. Its aerodynamic design hels your throws to go a lot farther, and won’t get stuck on any nearby trees and bushes. The bright colours also make them very visible, so there’s no losing it amongst your surroundings. 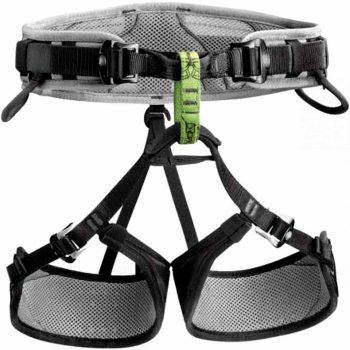 The Lukher Climbing Harness is very comfortable and easy to adjust. This harness comes with nice plastic sliders that keep the additional strap lengths spick-and-span and out of the way so there’s no fumbling while you climb. Its material is durable and high quality with topnotch stitching. That means that it was designed ot last a long time, no matter how much punishment you put it through. You will love it that this harness has an accessory loop for additional gear. The tie-in loop is heavy duty, and you also get a drawstring stow bag for your other gear. The bag is fairly sturdy and adequate for this purpose. It is a basic harness and works fine. However, it is not recommended for a frequent climber. There are no cushioned straps, and it feels rough after an hour of climbing. The harness has easily adjustable straps which hold securely. It is simple to put on and can be tightened very quickly for when you are in a hurry. The leg straps are readily available. It has rubber keepers that you can slide down to keep the straps from flying around after you tighten them. Overall this harness is very well made. It is durable, comfortable and comes with additional features like the double back buckles, strap clips, and gear loop to make this a great buy. Related: If you want to give your hands some relief from all that climbing, you may want to consider adding the Fusion Aluminium Rescue Pulley to your climbing kit. Available in blue or orange, this sturdy pulley has a carabiner attachment, and smooth rounded edges so there’s no risk of your climbing rope fraying. Its designed to be tough and is capable of enduring plenty of rough climbs. The Petzl Corax Adjustable Harness is the versatile harness for excellence, is easy to use and is also quite comfortable. This is more than just a “newbie’s harness,” as you will be able to hang in this all day long. It’s very versatile in its performance – used by both experts and beginners alike – and is capable of tackling everything from indoor climbing to traversing those difficult rock climbs out in the park. 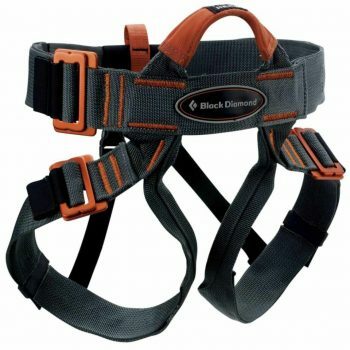 This harness is completely adjustable, durable, affordable, and lightweight. It also fits great. It comes with buckles on both right and left of the waist. Afterwards, you can let out or take in the waist to keep everything centered. The only issue you will have with this harness is purely cosmetic, as there aren’t a lot of neutral colors to choose from. Overall, the harness does not disappoint and offers solid quality at a great price. Related: Survival is key when you’re out in the woods by yourself, so it’s important that you have the right tools to help you get around. One of those tools is a survival knife, and the Petzl Spatha Knife is there to help you with all your rope-cutting needs. The blade can be locked into the open position, and it’s very easy to open, even with gloves on. With a one-size-fits-all and simple design, the Black Diamond Vario Speed Harness is great for rock gyms and outdoor programs. It is easy to put on, very comfortable, and does not cause suspension trauma. The line is out of the way until you need it. The harness has leg straps with dual metal and a self-locking waist. It does not require reverse looping for safe attachment, so that means less to fuss with. This is a significant safety feature if you plan on using them for many who would be going through climbing or rappelling as newbies. However, this harness isn’t really designed with comfort in mind. The straps will start to hurt after some time. Further, it has only a three-year lifespan. It is not 100% adjustable as the back elastic straps are sewn onto the leg loops, making it difficult to get a perfect fit since there is a limit to how far you can cinch down the leg loops. Related: Interested in getting involved in rope courses? Then you should definitely have the Fusion Adjustable Lanyard on your side. It has a webbed rating at more than 5000 pounds, so you know it will last you a very long time, and it’s completely adjustable to the length you want, up to 30 inches. However, you will need an additional carabiner for attachment, which you’ll have to buy separately. The YXGOOD Climbing Harness is ideal for people who work in garden art clip, tree clip, and firefighting on trees. The belt’s waist and leg strap are made of soft and breathable foam which is quite comfortable. The straps are smooth and curved, with stitched webbing to provide an excellent feel while climbing. Yet, they are also compact so you won’t have to worry about bulk and carrying unnecessary weights. 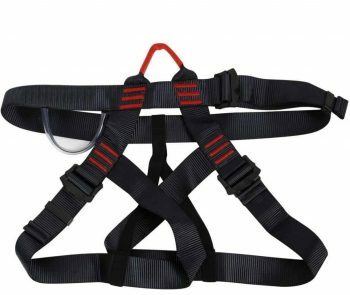 It does not have connection points required for a chest ascender harness, but it does have side rings which are stable and sturdy. However, the lack of buckles makes it difficult to get in and out of the harness. The various adjustments use different materials; the important ones are made of thick steel, while others are made from plastic. There are a lot of tool loops all solid, though they lack any powdered coating, so they’re likely to wear out over time. Related: Taking down tree hazards can be a hazard in and of itself, especially if you need to lug your chainsaw up the tree with you. In order to keep it safe, you should consider using the Weaver Leather Bungee Chain Saw Strap to solve all of your problems. The bright orange strap is capable of holding a lot of weight, and attaches easily to the handle of your chainsaw so you can carry it up with you to take care of those pesky branches. The Black Diamond Bod Harness is light, comfortable, and convenient while providing unrestricted freedom of movement and versatility for all-around climbers. It combines the right materials with a functional and efficient design. The harness has only one body anchor loop which will support your weight just fine. The only problem to keep in mind is that the anchor doesn’t move. You could wear it backward to have the anchor on the back, but it won’t be very comfortable if you are on a big wall for an extended period. It is padded well around the waist, so if you experience a hard fall, you won’t feel a holt in your legs or your waist. The padding also helps with providing better comfort. If you are a larger climber looking for a comfortable, sturdy harness for climbing, then this is definitely the one for you. The price is quite reasonable as well. Related: What’s the use of climbing if you don’t have a reliable rope? The Aishine Outdoor Climbing Rope is 33 feet long, which will definitely take you to new heights. It’s made of high-strength polyester and polypropylene, which are designed to support a lot of weight and is resistant to fraying, as long as you care for it properly. And that ends our list of the top-rated climbing harnesses that you can buy in the market. We hope that the details we’ve provided to you in this article have made it easier for you to determine the best harness for your needs in the future. The buying process itself isn’t easy, as even if you do find one that has all the features you’re looking for, you still have to try one on to see if it feels comfortable. And if it isn’t, you have to start the search all over again. Because no matter how much money you spend on a harness, you’re not going to use it if it starts cutting into your waistline and legs. So, which one did you like from our list of reviews? Do you have another all-times favorite? Please leave your opinion with us in the comments section below, and we’ll get back to you as soon as possible. Sean was backpacking since he was 7. He was born close to the RMNP and his father was a ranger, so life surrounded by mountains and wildlife is a norm for Colorado. He likes to explore, but prefers to stay in USA. In his opinion, there are too many trails and options in US to go abroad. Best Hiking Shoe Brands: Which Are The Top Outdoor Footwear Companies? Copyright © Backpacking Mastery. All rights reserved. Reproduction of any portion of this website only at the permission of Backpacking Mastery. The information provided on this site is for educational use only. It should not be used as a substitute for professional medical advice, diagnosis or treatment.